The quality of French milk and dairy products comes from the industry’s desire to produce a variety of good, healthy products. From the farm to the store, quality is everywhere: in best practices, controls, analyses, R&D, quality management, etc. Healthy milk is fit for consumption, meeting European food safety standards. Its germ and somatic cell content must not exceed the maximum levels allowed by regulation. These are key indicators of farming hygiene and cattle health. The absence of antibiotic residues is also rigorously controlled. Wherever raw milk is produced and collected in France, the same testing and analysis principles are applied to determine its composition and quality. Extra criteria may be required in some cases (e.g., for PDO status). The composition of milk varies between herds and their diets. It may be standardized, since milk is transformed into a wide variety of dairy products after collection. To ensure consumer satisfaction, the dairy quality chain starts at the farm and continues right to the store. This involves an unbroken cold chain, strict quality control of milk and dairy products, and traceability measures.. Milk is healthy and meets rigorous European food safety standards. The price of milk price paid to the farmer depends on its hygiene and safety features, as well as its fat and protein content. To ensure consumer satisfaction, the dairy quality chain starts at the farm and continues in the factory. A sample of milk is taken to analyse its composition and quality in an interbranch laboratory. In 1969, the French Godefroy Law introduced quality-based milk payments. The interbranch laboratory delivers a “quality passport”. Next-day processing and sending of results to the farmer and the dairy through an online tool: INFOLABO. 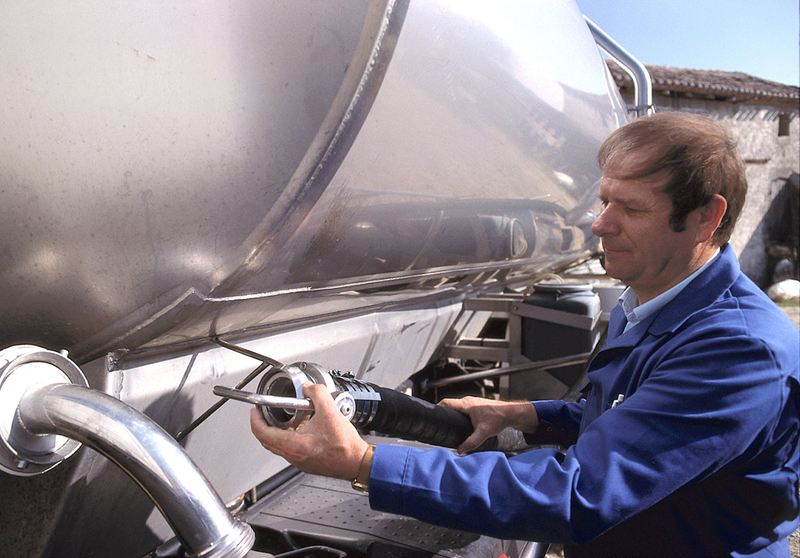 Cold chain management: transporting dairy products in refrigerated lorries and storing them in cold rooms. New quality criteria in the future? 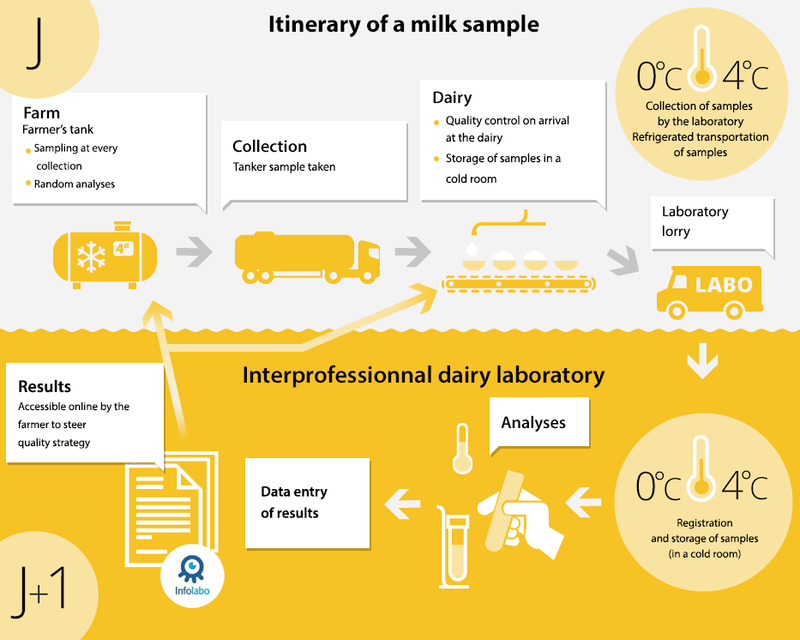 Nowadays, researchers are able to analyse the composition of milk very precisely and assess its nutritional value. 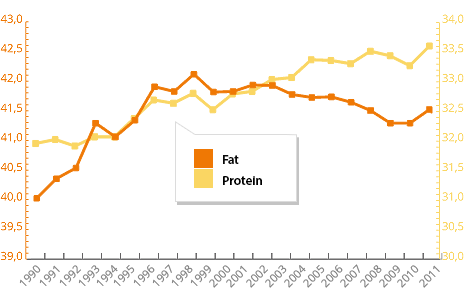 For example, they can quantify the different types of fats (omega-3, omega-6, etc.) and proteins (alpha and beta caseins, etc.). Will these nutritional and health criteria be included in milk analyses on farms in the future? Milk quality is highly controlled. Samples are systematically taken at the farm and the dairy before being analysed in laboratories. Created after the 1969 French Godefroy law on quality-based milk payments. A guarantee of independence: these laboratories are co-managed by representatives of milk farmers and buyers (private companies and cooperatives). Main mission: to ensure ongoing quality control for milk provided by farmers to dairies, by conducting analyses of its composition and quality, which are used as a basis for payment. French interbranch laboratories are accredited by the Ministry of Agriculture for their milk-payment analysis operations. 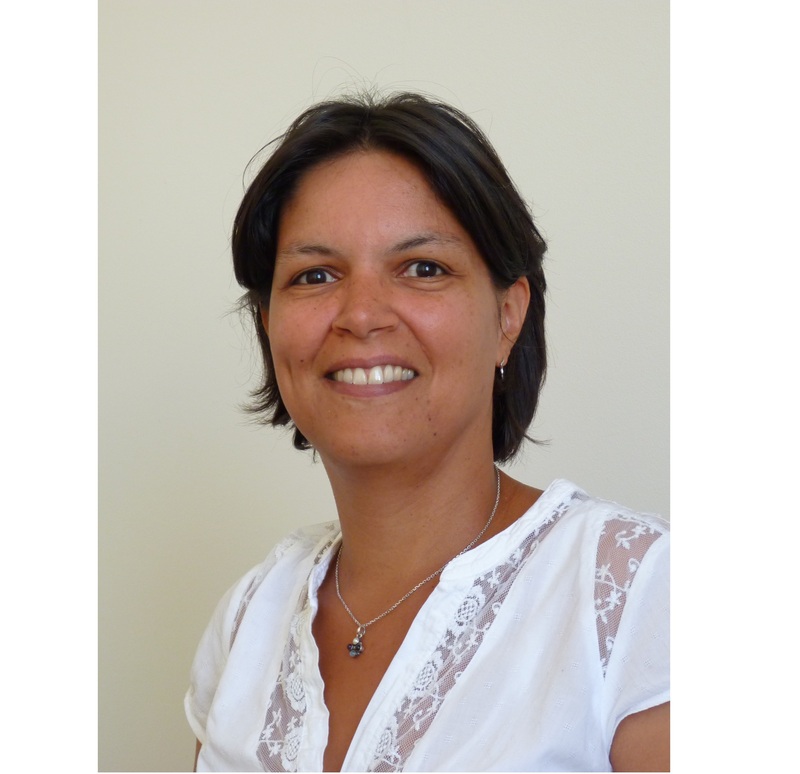 CNIEL coordinates and standardizes implementation of the analysis methods used. Dairy professionals are improving their analysis methods to exploit scientific progress and boost their effectiveness. All the analysis methods conform to standards set at a national, European and even international level. The French dairy industry closely monitors the work of the national organization for standardization (AFNOR) and the International Organization for Standardization (ISO) in particular. Milk quality control: a long story! Around 1385, a law condemned so-called “mouilleurs de lait”, unscrupulous farmers and merchants who added water to milk to artificially increase its volume. In 1777, a royal decree banned dairies from using copper pots to avoid contamination by verdigris, considered unhealthy. In the middle of 19th century, a decision was made to set up cowsheds in town centres to better guarantee milk freshness, given the sharp increase in consumption by booming urban populations. ... To the present day! Les acteurs de la filière laitière décident ensemble des critères de qualité qui déterminent le prix du lait. Les premiers critères retenus sont la richesse en matière grasse et une teneur en germes maîtrisée. Pour déterminer la qualité du lait, des échantillons sont prélevés à chaque collecte et analysés dans des laboratoires indépendants. Les résultats des analyses entraînent un bonus si le lait dépasse les standards de qualité, ou une pénalité s'il ne les atteint pas. Dans les années 70, des laboratoires interprofessionnels indépendants sont créés pour permettre des analyses fiables. Ainsi, l'évaluation de la qualité est objectivée et s'applique sur l'ensemble du territoire. Le CNIEL, créé en 1973, a pour mission d'assister les laboratoires et de contrôler l'harmonisation des méthodes d'analyse. Au fil du temps, la filière a décidé d'instaurer de nouveaux critères de composition et de qualité hygiénique et sanitaire du lait. Initiée par la Fédération Nationale Bovine (FNB) et la Fédération Nationale des Producteurs de Lait (FNPL), la Charte des bonnes pratiques est une démarche professionnelle soutenue par le CNIEL. C'est un outil d’auto-évaluation qui aide les éleveurs à progresser et améliorer la qualité de leur lait. En 2013, près de 95% des éleveurs laitiers y adhèrent volontairement. Over the years, the content of milk has improved. Milk produced in French farms now contains more protein and less fat. The quantity of germs has also dropped noticeably since the 1970s, demonstrating excellent food safety today. The French dairy industry’s renowned milk quality expertise, at both a scientific and technical level, enables France to play an influential role in the development of international food standards. In this way, France, as a member of the International Dairy Federation (IDF), has actively contributed to the Milk and Milk Products Committee of the Codex Alimentarius, set up by the United Nations Food and Agriculture Organization and the World Health Organization to develop these standards. France is responsible, for example, for the regulatory definition of milk, which prevents plant-based juices (e.g., soya) from using the term.